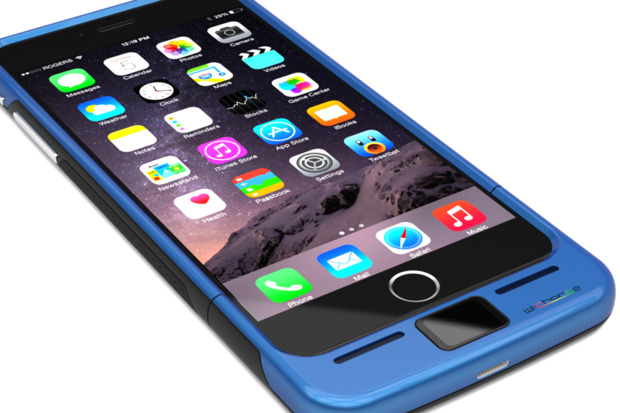 We've been promised wireless charging for years, but it's not really wireless. You still need a physical connection by resting your device's compatible skin or case onto a charging mat, which is marginally more convenient, perhaps, than a normal plug. 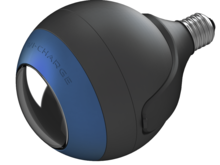 So I was happy to see a demonstration of real wireless power unveiled yesterday by a company called Wi-Charge. The technology has a H.G. Wells retro vibe, but it works -- and it might deliver on the promise of wireless charging. Wi-Charge's approach combines two technologies to do its thing, which is beam power to devices from as far as 30 feet away: infrared lasers and retroreflector mirrors. No, it won't fry whatever gets in the way of the beam. Yes, you can put your device almost anywhere and still receive the charging beam. The new power source for mobile devices and the Internet of things? Wi-Charge, which is now seeking hardware manufacturers to license its technology and get it into products in 2016 or 2017, hopes that mobile devices, wireless stereos, and Internet of things/home-automation devices from smoke detectors to cameras will adopt the technology. As we add more electronic gadgets to our homes, in places without power outlets, the appeal of this technology is strong. In Wi-Charge's approach, people would need wall-mounted chargers to power devices on walls or ceilings, and ceiling-mounted chargers to power items on desks and tables to deliver the power they need. Recognizing that people will not tear out drywall and hire an electrician to run new electrical wiring to such chargers, the company is working on chargers that are also LED light bulbs, so you can install the ceiling versions in ceiling cans and other such lighting fixtures as a bulb replacement. The wall-mounted chargers would likely plug into existing wall outlets. This artist's rendering shows how a Wi-Charge infrared power transmitter could be shaped like a lightbulb to work in existing fixtures; it would also include an LED lamp for lighting. A normal laser works by bouncing light between two mirrors, which both focuses the light particles into beams and concentrates their power. The beam is then allowed through a small opening to aim at its target. Wi-Charge puts one mirror in the charger and one on the device itself. The the beam automatically forms as infrared light emitted from the charger's "lightbulb" bounces between them. As soon as an object gets in the way, the bouncing of the light particles stops, and the beam shuts down instantly. Because the beam is infrared, not visible light, there's no danger of blinding people or animals who look into it, nor of melting plastic or flesh that gets in the way, nor do you see distracting light beams in the room. Yet the beam can deliver up to 10W of power -- enough to power several smartphones or other small devices. I put my hand into such a beam and didn't even feel a slight temperature rise. Yet doing so immediately cut off the power to the wireless radio the beam was powering. When I removed my hand, the power delivery resumed in less than a second. You might wonder how the beam travels as the device moves -- after all, a normal laser has two fixed mirrors, and they must be precisely aligned for the light to bounce between them to create the laser. Not only does the use of retroreflectors mean the receiver can move and its beam follows along, you can also tilt the receiver to about 40 degrees and still keep a line-of-sight connection to the charger. That's important -- a line of sight is required for this technology to work. Anything that gets in the way of the beam shuts it down by blocking the laser-creating bouncing. A Wi-Charge charger can establish an infrared charging beam between itself and multiple devices, as long as they have an unobstructed view of each other. The company envisions rooms having ceiling- and/or wall-mounted units to cover most devices' locations. 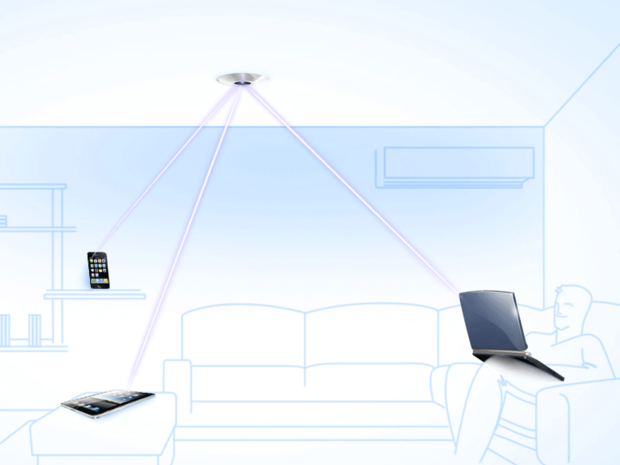 With the technology's self-aligning beams, devices can be charged even if you move them. Wi-Charge showed me a few receivers with a retroreflector of about 10mm (0.4 inch) square -- that was fine on a wireless radio but a bit awkward in a smartphone case. The company says such retroflections can be as small as 5mm (0.2 inch) square and be placed under the glass of a smartphone. If so, this technology might be plausibly embedded in a range of devices. One caveat: It's unclear how much power the Wi-Charge technology will need to beam sufficient power to devices, but the fact that the company is trying to embed it in standard lightbulbs is a good sign. Still, the chargers must always be on, to be ready for any device receiver that comes in range, so your total power usage might go up somewhat. By contrast, modern wired wall chargers and induction-charging "wireless" mats now typically have auto-off circuits when nothing is plugged in. Still, I'm intrigued. I hope a few manufacturers give the technology a real workout in their labs to see if it can be commercialized and live up to its promise.